A sports gear valet that organizes, dries and deodorizes all types of sports gear. It is made of plastic tubing having perforations where fan forced air through a deodorizer forces air through the perforations to dry and deodorize the sports gear that is hung on the valet. This product is made of plastic tubing, but can be more cost effective by being made via plastic injection or blow mold. Every hockey Mom knows the problem. Keep the skater’s gear in a duffel bag and within days… well, frankly the stuff reeks. Leave that uniform and protective equipment out to air dry and it clutters up a bedroom or ends up spread around every corner of the basement. Come time for practice, the gloves are here, the shoulder pads are there… and where is the helmet, anyway? The patented Ultimate Hockey Fan (UHF) solves sports-equipment storage problems once and for all. Best of all, it’s simple enough for a six year-old Mini Might to use. Organizes, with a perch for helmet, gloves, shoulder pads and virtually every piece of a youth hockey or lacrosse outfit. Everything stays in one place, and the UHF stands neatly near a wall or in a corner. Come time for practice, a young player is less likely to forget an important piece of the uniform. Dries as it keeps sports gear organized. With its patented drying system, the UHF gently circulates fresh air through every piece of equipment it holds, reducing the chance that mildew or stale odors will form. Deodorizes, thanks to a replaceable scent element that keeps uniforms and protective gear smelling fresh and clean. 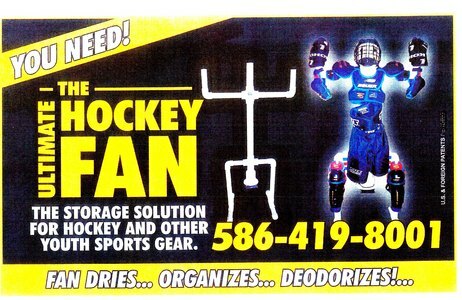 Proper drying and storage can extend the life of expensive sports equipment. The UHF protects your investment. The UHF is constructed of virtually indestructible PVC plastic and it will not rust. It’s lightweight, and easily disassembles for travel. The UHF makes life easier for parents and players alike.